According to Katsuya Toshikazu´s (勝矢俊一) article “New Studies on Nobuie” (“Nobuie no shin-kenkyû”, 信家の新研究), the 1st generation Nobuie (信家) was active around Eiroku (永禄, 1558-1570), Genki (元亀, 1570-1573), and Tenshô (天正, 1573-1592) in Kiyosu (清洲) in Owari province. That means he lived right in the turbulent period when the so-called “Three Unifiers”, i.e. Oda Nobunaga, Toyotomi Hideyoshi and Tokugawa Ieyasu, brought a close to the no less turbulent Sengoku period. We know that the Sengoku period, which arouse out of the local Kyôto Ônin War (Ônin no ran, 応仁の乱, 1467-1477), brought a century of political instability and warfare, but not of constant warfare as some suppose. However, it was a time when old power structures were overthrown, the “underlings were conquering the overlords” (gekokujô, 下克上), and an almost entirely decentralized state system under more or less independent warlords had emerged. Living over three or more generations in uncertainty about whom to serve and where resulted in a very own world of ideas and taste. The Sengoku period was also a great stimulus for the changes in Buddhism and the shift towards Zen and aestheticization. That means many formerly religious or upperclass activities “slopped over” to the common warriors and common people, for example the tea ceremony, painting and poetry. In terms of painting, landscapes and other secular subjects were increasingly depicted. That all resulted in certain guiding concepts of the arts, namely wabi (侘び, the spirit of quiet simplicity), sabi (寂び, aesthetic melancholy), and yûgen (幽玄, the unfathomable mystery). In that age of struggle, when warriors often risked death and witnessed the rise and fall of their friends and foes, constant awareness of and preparation for death were necessary and the impermanence of human life and achievement was omnipresent. In short, the inevitability of death was fully accepted and lived, supported by then very modern approaches of Zen Buddhism of a total affirmation of human life just as it is and regarding all daily activities as Zen-Buddhist practice. Tsuba were of course not excluded from these changes. By the time of Nobuie, more attention was paid to a “perfected imperfection” in the aforementioned sense of wabi and sabi, i.e. a work which looks as if created with no ulterior motives and no preconceptions by nature but by the use of perfected craftsmanship. In short, slightly irregular shapes and an uneven surface and rim were desired by those following this approach. With this in mind, Nobuie´s tsuba have much in common with tea ware because with the forging and hardening of the iron, many aspects show up only at the finished piece just like it is the case at firing a tea bowl. As indicated before, also the tea ceremony had experienced a shift from an expensive and exclusive furnishing to simple and kind of everyday implements, brought into a certain concept by Murata Jukô (村田珠光, 1423-1502), Takeno Jôô (武野紹鴎, 1502-1555) and Sen no Rikyû (千利休, 1522-1591). 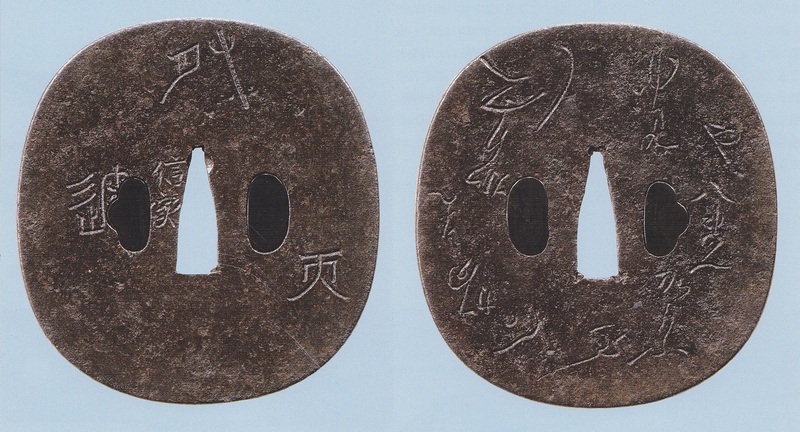 But with this article I want to focus on the inscriptions found on Nobuie-tsuba which transport perfectly the attitude of the Sengoku period. 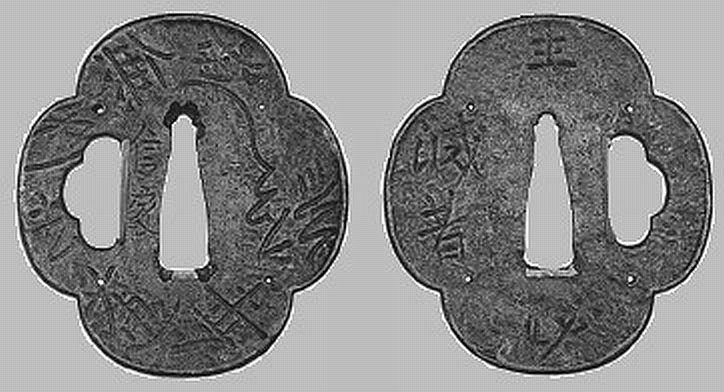 First I want to start with a tsuba of Nobuie which shows the inscription “Namu Hachiman Daibosatsu” (南無八幡大菩薩) on the ura and carvings of a bow and arrow on the omote (picture 1). The inscription means “Hail Hachiman, the God of War”, but with the depiction of bow and arrow, the motif represents the so-called “Yumiya-Hachiman” (弓矢八幡), i.e. Hachiman in his function as God of Archery. The name “Yumiya-Hachiman” was also called when a warrior was taking an oath. 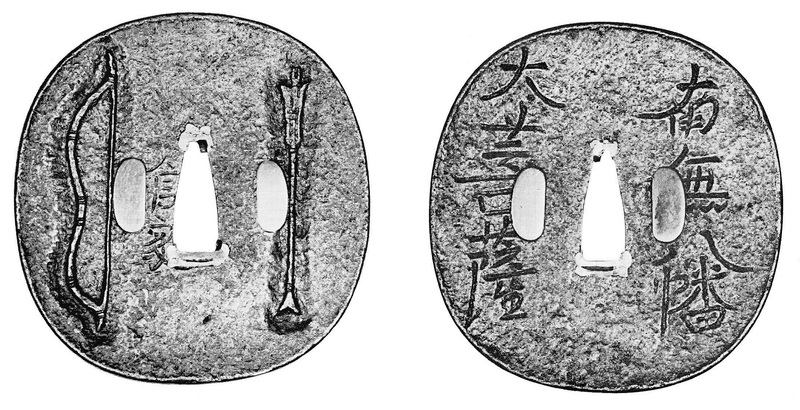 The Yumiya-Hachiman approach was also adopted by the next tsuba (picture 2). It bears on the side with the mei the inscription “un wa ten ni ari” (運有天, “Fate lies with heaven”) and on the other side the hiragana inscription “Yumiya-Hachiman – kamafu-maji hito ga kamahaba kamafu beshi“ (ゆみやはちまん・かまふまじ人がかまはばかまふべし) which means about „one should only interefere when asked“. That means all three inscriptions are not connected to each other and have to be interpreted as an arrangement of Sengoku-era proverbs or mottoes. The same arrangement of the un wa ten ni ari motto can be seen on the next tsuba (picture 3) which comes in a quite pronounced mokkô-gata. The ura side of this piece bears the Buddhist prayer “Namu Myôhô Renge Kyô” (南無妙法蓮華経, “Glory to the Sutra of the Lotus of the Supreme Law”). This prayer or mantra is chanted as the central practice of Nichiren Buddhism and is referred to as “daimoku” (題目). That means a tsuba with daimoku motif depicts the Nichiren-mantra “Namu Myôhô Renge Kyô”, and if the ends of the strokes are noticeable elongated, we speak of a so-called “hige-daimoku” (髭題目, lit. “daimoku with beard”). 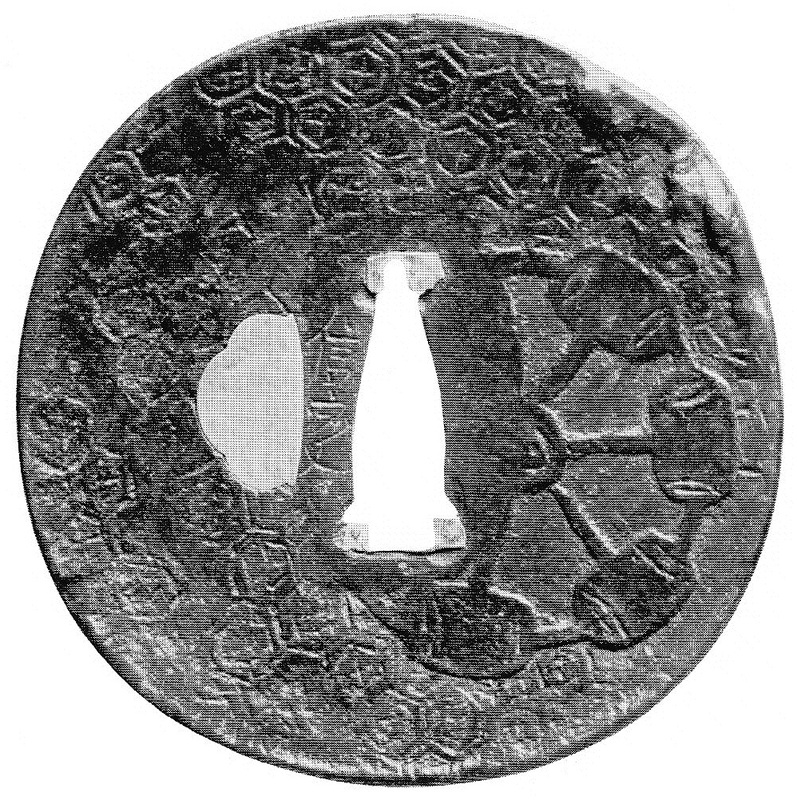 The daimoku is also the central motif of the two tsuba shown in picture 4. Both are in mokkô-gata, although not that pronounced as the last piece, and show a ko-sukashi opening in the form of an axe. The axe has to be seen in the aforementioned context of depicting ordinary everyday objects. 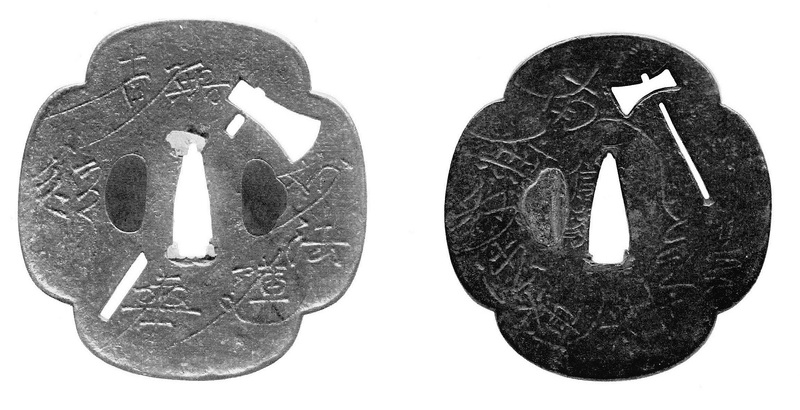 The tsuba shown in picture 5 has a two-segmented so-called “ryô-mokkô-gata” (両木瓜形) but rotated about 45 degrees counterclockwise. It bears the inscription “kirimusubi-tachi no shita koso jigoku nare, fumikomi yukeba ato wa gokuraku” (切り結ぶ太刀の下こそ地獄なれ踏み込みゆけばあとは極楽). This is a proverb from swordsmanship and means “to be under crossed swords is hell, to make a sudden attack is heaven”. Also there exists a maru-gata tsuba of Nobuie with the inscriptions „ie ga mazushikunatta, tomo wa sukunai“ (家貧双月少, once a family becomes poor, friends will make themselves scarce“) on the omote and side „yabureta koromo no nakaba ni, shirami ga ôi“ (衣破半虱多, “in badly damaged clothes, there are many lice“) on the ura side, inscriptions which can be considered as general warnings. A mokkô-gata tsuba shows a waka poem of the Zen priest Ikkyû Sôjun (一休宗純, 1394-1481) which goes „yakeba hai umeba tsuchi to naru mono nani ga nokorite, tsumi to naruran“ (焼けば灰埋めば土となるものを何が 残りて罪となるらん, „when everything is burnt to ash and buried under the earth, all what remains is the sin“). Sôjun was well known for such nihilistic and drastic poems. 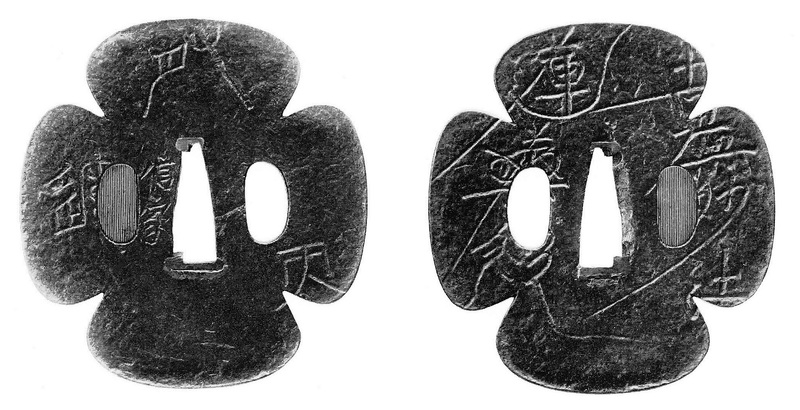 Another inscription on a Nobuie-tsuba goes „ningen-banji saiô ga uma“ (人間萬事塞翁馬) which means „inscrutable are the ways of heaven“ or „fortune is unpredictable and changeable“. Literally, the characters mean „all things (banji, 萬事) of mankind (ningen, 人間) are like the horse (uma, 馬) of the old man from the border area (saiô, 塞翁)“. This saying refers to a story from ancient China when an old man living near the northern border of the country once lost his horse, but as soon as it escaped, it came back with another horse. This shows how close sometimes fortune and misfortune are and the saying is also used as warning that the people’s fortunes can´t be predicted. The piece shown in picture 6 combines the Nichiren-mantra “Namu Myôhô Renge Kyô” with the inscription “shôja-hitsumetsu“ (生者必滅, „all living things must die“), another reminder for the transitoriness of life. 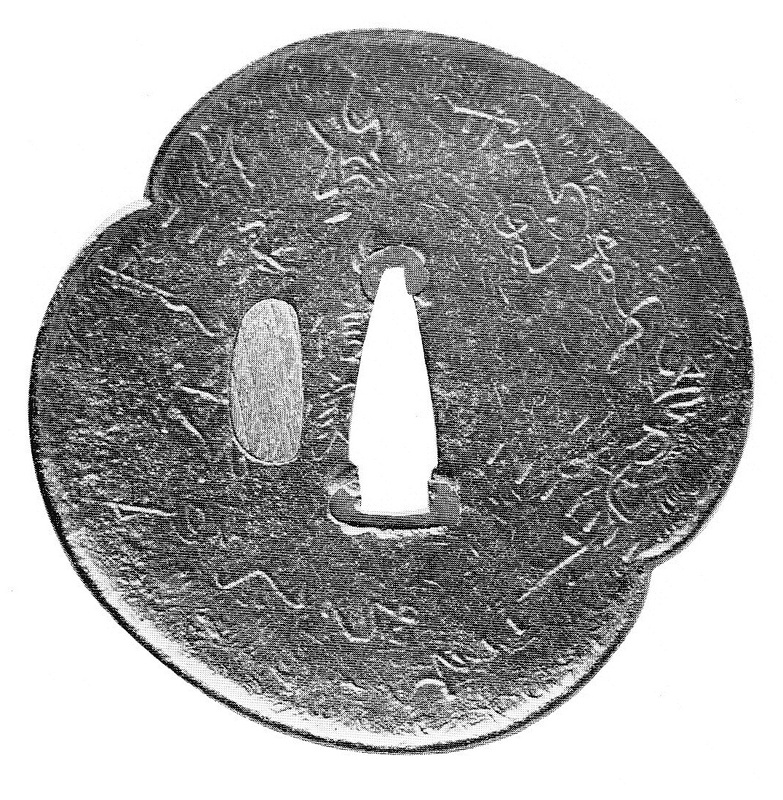 And tsuba with an irregular mokkô-gata combines the provers “un wa ten ni ari” with the sentence “gusoku wa shichiya ni ari” (具足有質屋, lit. “the armour is in the pawnshop”). It is assumed that the latter inscription refers to the large number of poor samurai who had to pawn their armour and when that was not enough even their swords. And last but not least I would like to introduce two Nobuie-tsuba which represent the transitoriness of life not via inscriptions but via a pictorial design. At the first one, the motif is quite obvious as we see on the ura side two skulls. But we also see stylized and on the omote side non-stylized water wheels. Water wheels are usually called “suisha” (水車) but when they show ladles (hishaku, 柄杓) like here, also the term “tsuchi-guruma” (槌車) is used. The wheel stands for the continuous carmic rebirths within the six domains (rokudô, 六道) of the desire realm (yokukai, 欲界). 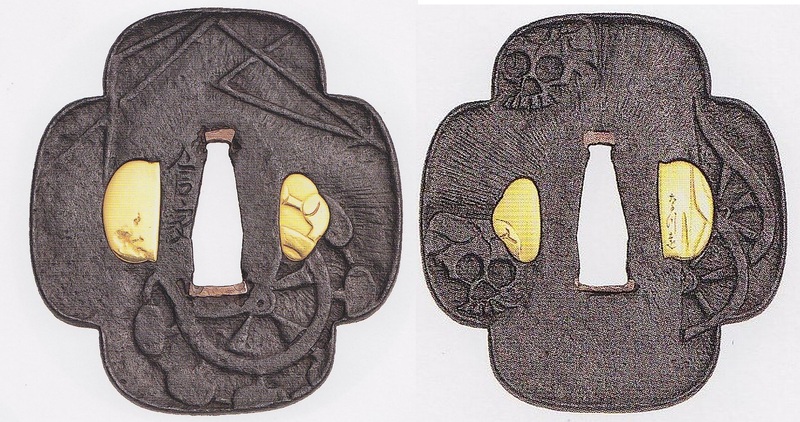 By the way, the gold plugs of the tsuba shown in picture 7 were added by Kanô Natsuo (加納夏雄). He signed the one plug with “Natsuo” using the characters (なつ遠). I hope this was an interesting trip into the world of ideas of Sengoku-period bushi as seen on Nobuie-tsuba and I would like to continue this matter in the future by presenting some tsuba with inscriptions by Tsuchiya Yasuchika (土屋安親).